The bargelike, 640-foot-long Evolution, owned by Harbor Island-based Vigor Industrial, was released into the bay from a partly submersible cargo ship. What appeared to be a sinking ship on Friday morning in Elliott Bay was actually a rare but orderly operation to deliver a dry dock to Vigor Industrial in Seattle. A dry dock is an amphibious platform that can be submerged while a ship is floated on or off, as an alternative to hoisting a vessel by crane. The 640-foot-long dry dock, Evolution, arrived last weekend on the deck of a broad cargo ship, the Zhenhua 33. This ship crossed the ocean from Qingdao, China, where Evolution underwent repairs. On Friday morning, the Zhenhua was ballasted using Puget Sound water, submerging it evenly a few feet below the bay surface. As the ship plunged, the dry dock floated off wood deck beams toward the starboard (right) side, said Dan Keen, Vigor dockmaster. From there, it was towed to Vigor’s base on Harbor Island. Vigor found the Evolution in South Korea and spent $20 million to acquire and renovate it, company spokeswoman Jill Mackie said. Its first client will be the state ferry Elwha on March 30. “Along the West Coast, there’s a shortage of dry-dock capacity. This has been a matter of concern for all types of customers,” Mackie said. The Evolution is more than 100 feet longer than the two other dry docks at Harbor Island, which ought to bring new clients and add jobs, Keen said. Bigger dry docks have often been used to launch new ferries and replace old ones. In 2013, a pair of cracked, improperly designed Highway 520 bridge pontoons were floated onto a Vigor dry dock for sealing. 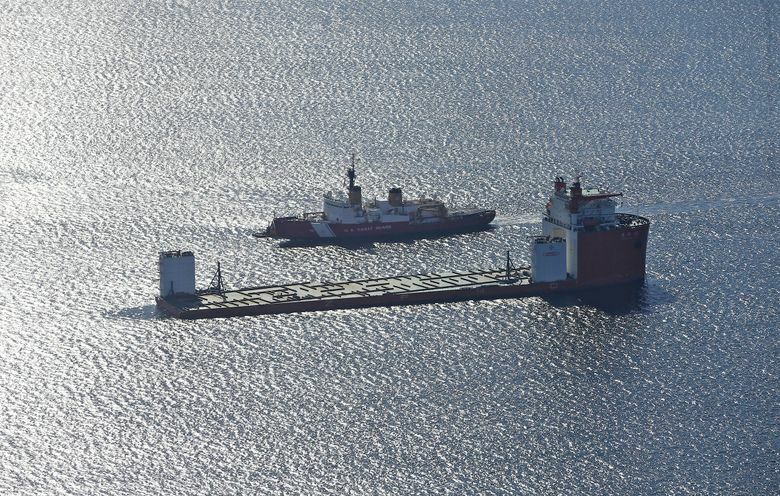 The Coast Guard was notified of an emergency call by a worried onlooker, but officers say they quickly noticed it was the dry dock delivery going as planned.